Your battery charger has adjustment for the voltage and rate of charge. If your boat has a 24-volt battery system, it probably has two 12-volt batteries that are wired together so that the negative post of the first battery connects to the positive post of the second battery. If your charger is small enough to be carried aboard your boat, you can leave these cables in place, since the charging procedure requires it. Battery charging also gives you the opportunity to inspect--and replace if necessary--damaged cables or batteries. Ensure that the SCR battery charger is unplugged. Open your boat's battery box to expose your battery bank, and disconnect the positive cable from the first battery and the negative cable from the second battery. 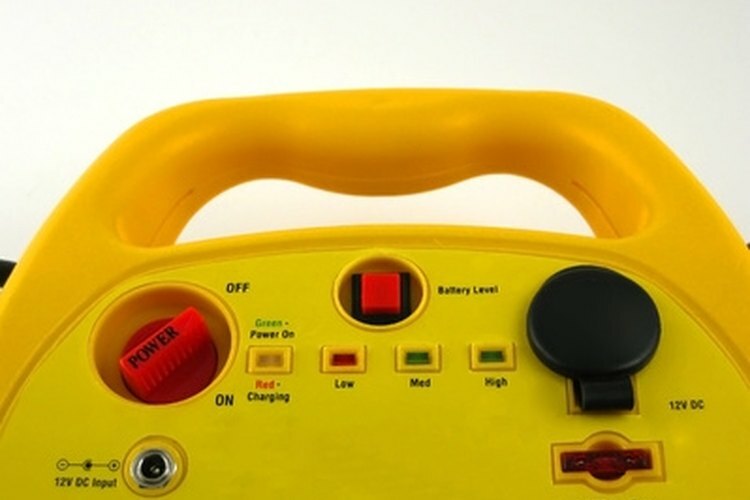 Connect a jumper cable to the negative ("-, " "NEG" or "GND") pos of the second battery. Clip the alligator clip at the end of the wire from the negative ("-, " "NEG" or "GND") post of the battery charger to the jumper wire. Plug the battery charger in. Turn the battery charger on, set the rate of charge to 20 amps. The charging time will vary depending on how deeply your battery is discharged, but at that rate, most batteries will be fully charged in six to 12 hours. Set the charging voltage at 14.4 volts. You need not remain present while the charger is operating. The charger will shut down when the charge is complete. When charging is complete, unplug the charger from the wall. Disconnect the charger's negative wire from the jumper cable and disconnect the charger's positive wire from the battery. Disconnect the jumper cable from the battery, and store the jumper cable and battery charger. Installing an amp hour meter on your boat will help you avoid discharging your battery bank below 50 percent of its charge, according to Don Casey, boating expert for the Boat Owners Association of the United States. When your batteries are fully charged, the meter will read 0. Casey also recommends charging your battery to 85 percent of capacity as an alternative that saves engine running time, for those who charge their batteries from their engines and don't have an amp hour meter. This is electrical work and should be approached as such, with all reasonable precautions. This includes not smoking and not carrying an open flame within 50 feet of a charging battery. How do I Install a Dual Battery System in a Vehicle?